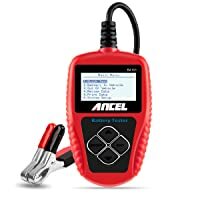 ANCEL BST500 Battery Tester is a modern digital battery tester which is one of the best battery testers on the market. It will help you give the gadget the bases of determining whether the test fails, pass or re-test. ANCEL BST500 is a battery tester which enables you to easily and accurately measure a 12V, 24V and up to 2000 CCA battery. This device checks the capability of the cranking current and determines the nature of your battery in the backlit LCD screen. There is nothing worse like trying to start your car but fails to turn over. That’s why you always have a battery tester which gives you an insight of your car battery. ANCEL BST500 is a battery tester which can also detect the common faults of starter and generator charging system which enables you to repair and solve the vehicle problems quickly. It also displays the measured battery voltage, CCA battery, estimated remaining life and the internal resistance. ANCEL BST500 100-2000 CCA battery tester is fitted with LCD screen which is easy to read even in the light. This screen displays the current battery status whether it is great, good, okay or needs replacement. It also displays the measured battery voltage, CCA battery, estimated remaining lif, and the internal resistance. 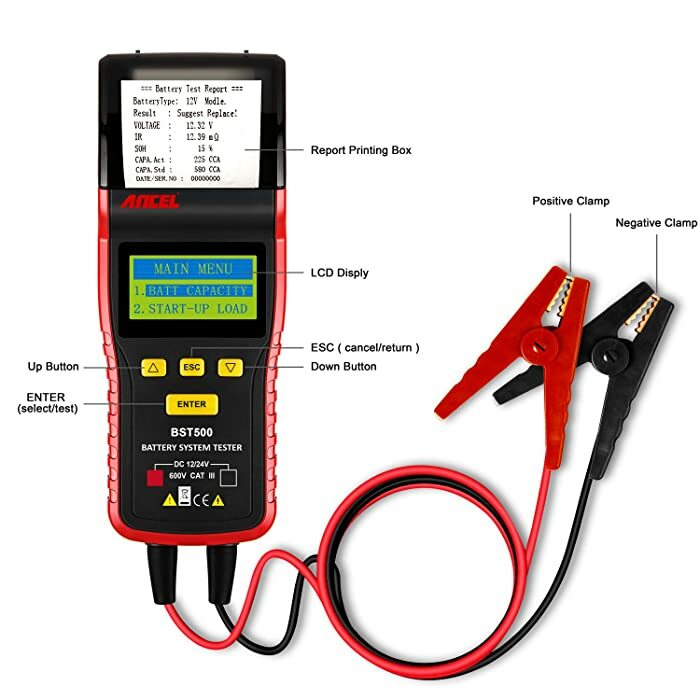 This battery tester enables you to have quick analysis without necessarily disabling the ignition. It can test and analyze most of the battery rating systems which includes the CCA, CA, MCA, BCI, JIS, IEC, DIN, SAE, GB, and EN. With this type of battery tester, you can directly check the bad cells and get the test result display within about 2.5 seconds. ANCEL BST500 100-2000 CCA battery tester compared to others gives 2x faster results than most of the battery testers. When used, this gadget gives nearly identical CCA number and good for matching batteries. The testing operation in this tester is safe and secure. It is fitted with clamps features which have reverse polarity protection and does not emit a spark. 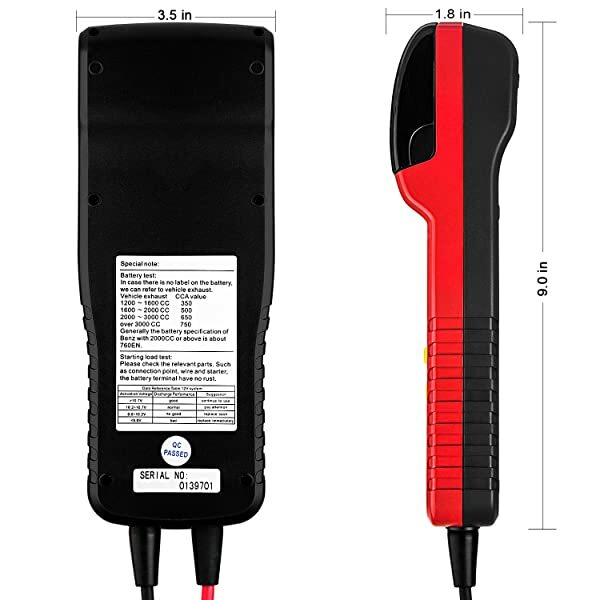 This allows you to perform the test without disconnecting the battery thus saving time and effort. Most of the battery testers are not integrated with this feature. ANCEL BST500 100-2000 CCA battery tester has a built-in integrated printer which enables you to quickly print the test results for record keeping with date and time functionalities. This device has features that same as the expensive ones. It has decent quality features which give quick and accurate results. Also, this device enables you to check the remaining battery life and gives the internal battery resistance. The built-in integrated printer which enables you to quickly print the test results for record keeping with date and time functionalities. ANCEL BST500 100-2000 CCA battery tester is handy and easy to use. You can easily check the status of your car when the check engine light comes on and displays the code for each problem. It is great to have it when going around with your car so that you can be able to check your car battery status in a snap when prompted. Most battery scanners just give the codes which are hard to figure out what it means. This device will give you codes and indicate the problems thus enabling you to understand the state of your battery without the need of an expert. Also, the LCD screen is bright and allowing you to read with ease. It can also support 100-2000 CCA battery making it ideal for most vehicles. The strength of ANCEL BST500 100-2000 CCA battery tester is that it can test both 12V and 24V. This enables this device to be compatible with most cars, minivans, SUVs and small trucks. It can also support 100-2000 CCA battery making it ideal for most vehicles. The weakness of this BST500 is that it can only perform a limited test and sometimes gives inconsistent results. The printout fonts are also small making it hard to read. LCD screen which is easy to read. Sometimes the results are not consistent. 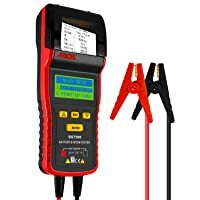 Bottom Line If you want something for your home use, then go for ANCEL BST500 100-2000 CCA Battery Tester. 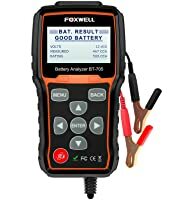 If you want a tester with extensive functionalities for your auto shop, then go for models like FOXWELL BT705 which features extra functionalities. ANCEL BA101 is simple for beginners. 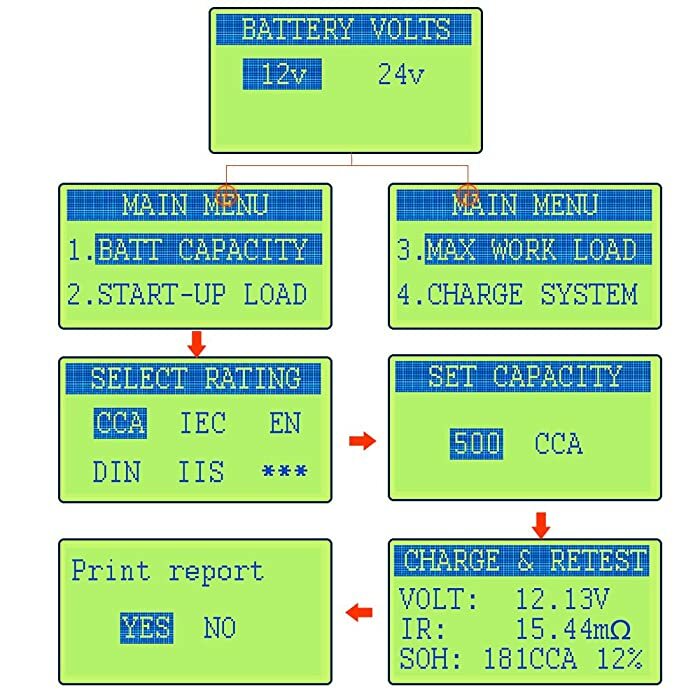 Depending on the model, battery testers have different levels of accuracy. Someone like a garage owner needs a tester which gives more information and has extra features. These include functionalities such as engine light, ABS, TPMS relearn, SAS, Oil reset, DPF and EFB reset. 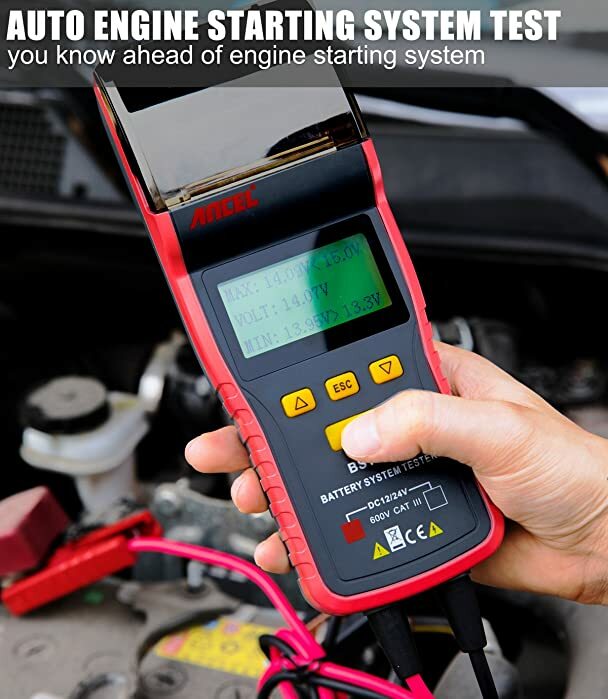 Good testers should also perform multiple tasks such as cranking test, battery test, and engine test. If you want a tester with extensive functionalities for your auto shop, then go for models like FOXWELL BT705 which features extra functionalities. If you want to buy for your home use, then go for ANCEL BST500 100-2000 CCA Battery Tester. The best battery tester should also feature other devices like built-in printers and PCs for detailed test analysis. With Foxwell NT650, you can read and erase codes from almost all the main systems of a car. They include ECU, ABS, SRS, EPB, DPF, TPMSTBA/TPS, CVT, and BRT. A light, fast and smart scan tool, the Snap-On VERUS PRO D10 is the perfect companion for any professional auto mechanic. Check it out NOW! !